How Did AMD Fare In 2018, And How Much Can Its Earnings Grow In 2019? How Can AMD Reach $40 By Next Year? How Much Can EPYC Processors Boost AMD’s EPS Over The Next Three Years? Is AMD’s Price Run Justified? How Sensitive Is AMD To Its EBITDA Margin Change? What’s AMD’s Upside From Its Push In Embedded Market With New Chips? AMD: A Good Year Ahead? AMD (NYSE:AMD) has seen stellar growth over the past few quarters led by its Computing & Graphics segment, which is benefiting from the success of its Radeon GPUs and Ryzen mobile processors. Ryzen processors are gaining popularity due to their competitive power at a relatively lower cost. This trend will likely continue in the near term, and drive the earnings growth for AMD. We have created an interactive dashboard ~ What Is The Outlook For AMD ~ on the company’s expected performance in 2018. You can adjust the revenue and margin drivers to see the impact on the company’s overall revenues, earnings, and price estimate. We forecast AMD’s overall revenues to grow in the mid-20% range for the full year, in line with the company’s guidance. This growth will be primarily led by the Computing & Graphics segment, which has seen a strong revenue growth in the recent past. The segment revenues have grown from less than $2 billion in 2016 to over $3 billion in 2017, and we forecast it to be north of $4 billion in 2018. This can be attributed to higher demand for its Radeon GPUs and Ryzen mobile processors. In fact, several Ryzen mobile processor based notebooks from various OEMs (original equipment manufacturer), including Samsung and Lenovo, have been launched in the recent past, and more will likely follow in the coming quarters. The second generation of Ryzen processors was launched recently, and it will likely aid the segment’s future growth. Radeon GPUs are also doing well in the market. These GPUs are focused on the enthusiast gaming segment, which was dominated by Nvidia. However, given the high performance of Radeon, AMD has been able to make inroads into this market. Higher demand for Ryzen and Radeon will also bode well for the segment margins. We forecast the segment adjusted EBITDA margins to improve to around 15% in 2018, led by higher pricing. 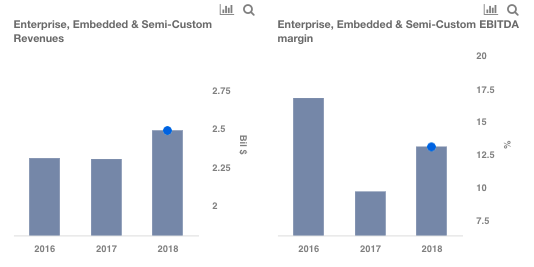 Looking at AMD’s Enterprise, Embedded, & Semi-Custom segment, we forecast the revenues to grow in high single digits, primarily led by its EPYC processors, which is finding increasing acceptance among corporates. In fact, these processors are now used by over 50 customer platforms, including Cisco and HP Enterprise. An increased acceptance by corporates should help sustain the momentum in the enterprise business, and also aid the segment margins. Overall, we expect the Computing & Graphics segment to drive the company’s near term growth, led by Radeon and Ryzen products. We currently forecast the earnings of $0.52 per share in 2018, and a price to earnings multiple of 28x by the end of 2018, to arrive at our price estimate of $15 for AMD, which is at a discount of over 20% to the current market price.